Great news!! So glad to hear your pain is gone ,or, almost gone.Love the color of the new bag. I’m really glad to hear you’re on the mend. My personal favourite fix for sore arthritic hands is a warm paraffin wax bath, very soothing and comforting for topical relief. So glad you are feeling better, Tim! 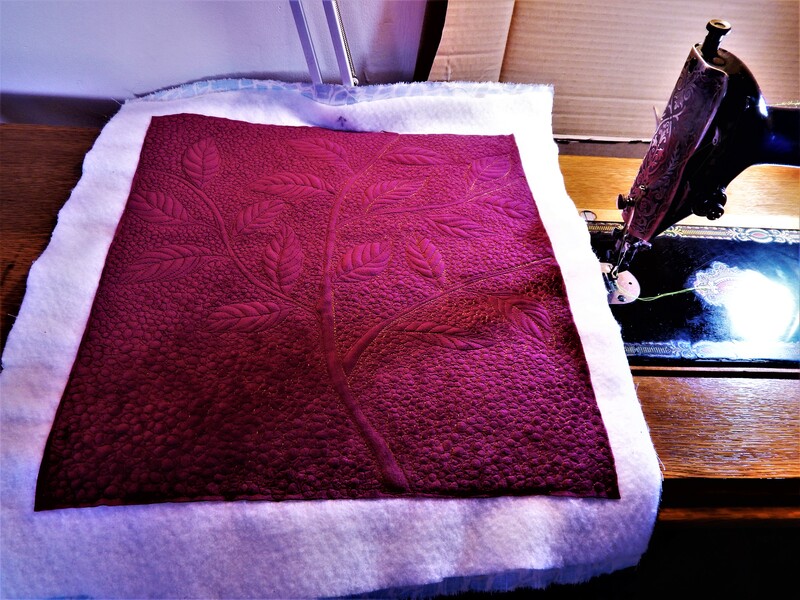 Gorgeous quilting on the bag. Glad to read that you are “mending!” Here’s to eating foods that don’t cause you pain and that bring you good energy! Slow and steady wins the race! Glad you’re getting well! Well, for a sick guy, you’ve been very productive, so I can’t wait to see what you tackle now that you’re healthy! Hopefully that is the end of that; happy to hear you’re on the mend! So glad to hear the procedure worked! Now to build your strength back. Hope you are feeling lots better very soon. I am so happy that your ordeal is over. Yay! 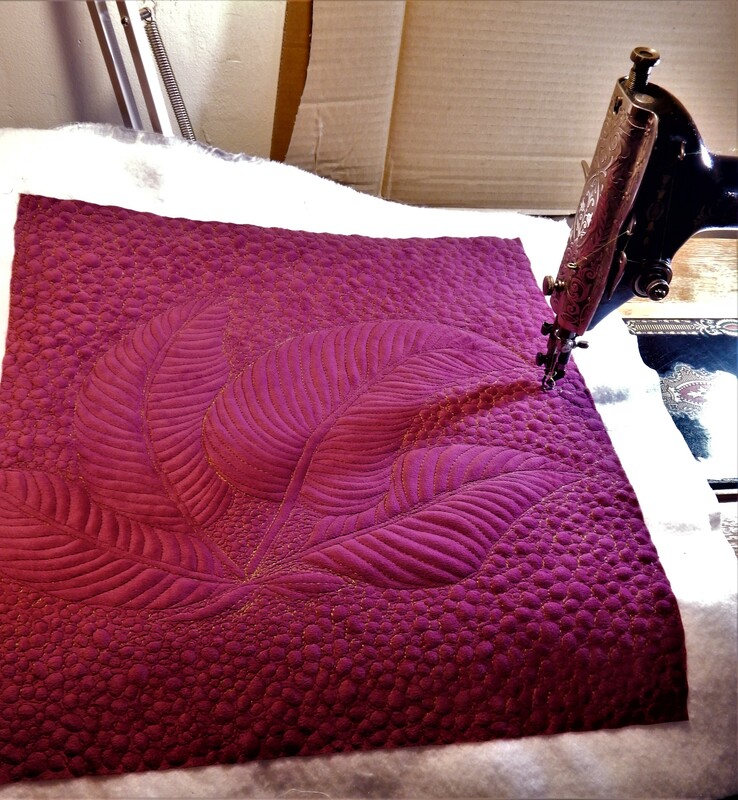 Your leaf patterns are my favorites so far of your machine quilting. With your background in botany it makes sense that you have found a new niche for your talents. My best wishes for continued improvement in your health. Oh Tim, I’m so happy 😁 the last one is completed! What a trial you’ve traveled!! Now restoration for your total body! Praying for your total strength & healing – just take it slow – don’t overdue! And be sure and get plenty of water especially early morning. That is wonderful news Tim! So glad it’s all been figured out and taken care of. Do take time to rest and recover – then you can go like gangbusters on your many beautiful projects. Yay! So glad to hear the abdominal pain is essentially gone! Good to hear. Now breathe! I love the colour on that bag, it is so bright! What great news Tim! I’m happy to hear you’re report! I’ll continue to keep you in my prayers. You do such beautiful work! So happy to hear you are on the mend! I too have been thinking of you…… anything we can do??? I was at Rocky Mountain Quilt Museum yesterday and saw 3 beautiful quilts. They were all jaw dropping beautiful, and it was really fun to see Teddy. It almost felt like I could reach out and hug him. I too have arthritis in my hands, and I know this will sound silly but after I hold my little lap cuddler dog, Wylie, for a bit, and then give him a tummy rub, my hands loosen up. They’ll never be perfect but that does seem to help a lot. I’m glad to hear your ab pain is gone. It has been quite a while since i visited your site to see how you are doing, and reading this post I see it has been while since you posted. I hope that your procedure to do the last part of the fix toy our problem has worked and that you are feeling much better. You have many many fans out there. And I am a proud owner of one of your bags- I feel so lucky to have it. Wishing you good health and continued time at your machines. Give teddy a scratch or two for me! Hi Tim, I too have been wondering how you are doing. I hope you are well and busy working on some fabulous project or two. I don’t have a blog, but have enjoyed following g your for some time. Just wanted you to know you are missed and thought of. Hi Tim, I thought about you yesterday while I was finishing up hand quilting a Christmas quilt. Some time ago, you gave a wonderful tip to safety pin a hand towel to the edge to keep the edges tight in the hoop. I always think of you when I do this. I hope you and Teddy are well and had a peaceful Christmas. I miss hearing about your quilts and garden. Best wishes for the New Year!!! Tim, still hoping you and Teddy are doing OK! Wishing you the best for the new year! Rest and be good to yourself. Hi Tim, I hope you are doing fine and all is well. Hope Teddy is doing fine too .